Storyboard Pro’s user interface is comprised of several views. You can customize your workspace to suit your working preferences, save it as a new workspace, and load it from the Workspace toolbar. The first time you open Storyboard Pro, the default Drawing workspace is loaded. There are a total of eight ready-made workspaces. This workspace is designed to enable you to draw your storyboard efficiently. The main space is the large Stage View and the Thumbnails view is at the bottom. This workspace also gives you quick and easy access to all your tools as well as the Panel and Storyboard views. This workspace is designed with the process of animatic creation in mind. The main space is the large Stage View and the Timeline view is at the bottom, where you can easily edit the timing of your panels, transitions and sounds. This workspace also gives you quick and easy access to all your tools as well as the Panel and Storyboard views. This workspace is designed to provide a well organized overview of your project. The main space is the Thumbnails view where you can efficiently reorganize the order of your panels. This workspace displays your project as a classic horizontal paper storyboard layout. The main space displays three panels at-a-time, with the panel information shown below each one. This workspace displays your project as a classic vertical paper storyboard layout. The main space displays two panels at-a-time, with the panel information shown at the side of each. This workspace displays your project uses a different set of views than the other workspaces. Access is only given to a certain number of features. This maximizes the viewing space to focus solely on the story being pitched. The Pitch Mode workspace occupies the entire display screen. There are no toolbars or top menu available. This workspace displays your project with the views required to quickly setup your pdf export. This workspace displays your project with the views appropriate for working with 3D objects, including the camera, top view, timeline, and layers—see Working in a 3D Space. There are several ways to load a workspace in Storyboard Pro. • From the View toolbar, click a workspace button. • From the top menu, select Windows > Workspace > Workspace > the desired workspace. 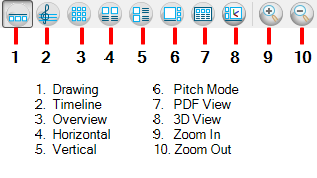 • Use the keyboard shortcuts  to  to open the corresponding workspaces, the only exception being PDF View (there is no shortcut for this option, you must use the button on the View toolbar. The Workspace Manager allows you to modify, create, delete, rename, and reorder workspaces. NOTE: The Workspace toolbar is not displayed in the default workspace. Before using it, you must display it. Select Windows > Toolbars > Workspace from the top menu. 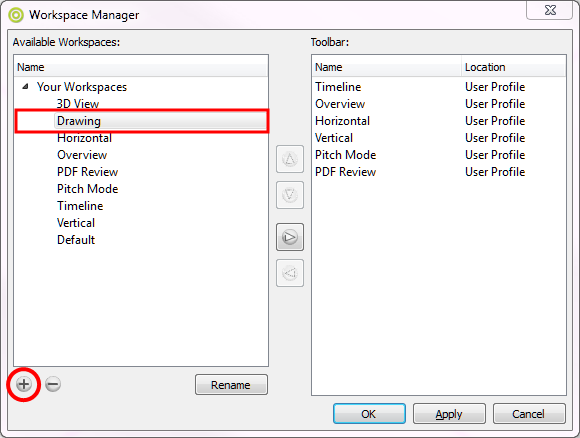 In the Workspace toolbar, click the Workspace Manager button. In the Available Workspaces list, select an existing workspace. At the bottom of the Available Workspaces list, click the Add button to add a workspace. Select the new workspace you created, then click the Rename button and give it a new name. Select the new workspace and click the Right Arrow button to send it to the Workspace toolbar. Storyboard Pro automatically saves the changes made to a workspace. This means that when you resize, move around, add or delete views, your workspace will be automatically saved in its current state. You can save a workspace manually, or as a new version to avoid overwriting the current one. ‣ Select Windows > Workspace > Save Workspace. Select Windows > Workspace > Save Workspace As. The Save Workspace As dialog box opens. Type in a name for the workspace. 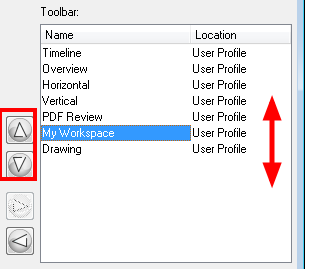 From the Toolbar list on the right, select the workspace to delete and click the Left Arrow button to send it to the Available Workspaces list. This removes it from the Workspace toobar. 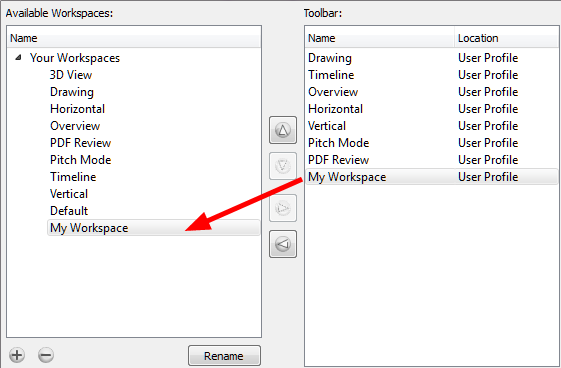 From the Available Workspaces list on the left, select a workspace and click the Delete button. In the Workspace Manager, select the workspace to be hidden.Click the Left Arrow button to send it to the Available Workspaces list. You can edit the order that the available workspaces are listed in the Workspace toolbar’s drop-down menu. From the Toolbar list, select the workspace to be reordered and click the Up or Down Arrow buttons to move it up or down. You can restore the modified workspaces to their original default layout. ‣ Select Windows > Restore Default Workspace.